This is last in a series of related posts on Fun Tech Stuff going under the hood with XML and its uses in learning technologies: Learning Management Systems, SCORM, Tin Can, Metadata, and XML, as well as examples of XML in SCORM and XML in eBooks. Most ebooks, including the Kindle (with minor proprietary variations), are based on the open, XML-based EPUB standard. And what does an EPUB ebook look like on the inside? Believe it or not, it is essentially a zip file. And if you unzip it, you will find a folder with a whole set of other files and folders filled with XML files, XHTML files (a stricter version of HTML), image files, and maybe even sound and video files. All these files are stitched together—you guessed it—through the magic of XML, doing it’s semantic job of providing meaning and context to all that surround it. One of the key files in an ebook is the content.opf file. It tells the ebook reader (e.g., your iPad or Kindle) what the book is, and how to navigate through it. 1. Yay! The file starts with a line that identifies it as an xml file. 2. The next line defines it as a package file, as defined by the Open Packaging Format bit of the EPUB standard. 3. Next comes the metatada section. Notice the “dc:”? That refers to the Dublin Core metadata standard discussed in our previous Metadata post. 4. Next comes the manifest, with its list of all the files that make up the ebook. 5. Finally comes the spine, which tells your ereader the order in which the content should be presented. And those are just a few of the ways in which XML helps people and computers work more closely together to improve the meaning and the context of information. This is next in a series of related posts on Fun Tech Stuff going under the hood with XML and its uses in learning technologies: Learning Management Systems, SCORM, Tin Can, Metadata, and XML, as well as examples of XML in SCORM and XML in eBooks. As you recall from our previous post, SCORM is a set of technical standards that define how Web-based online learning content and LMSs communicate with each other. SCORM is composed of three sub-specifications, one of which is the content packaging section, which contains an XML file called imsmanifest.xml. The XML manifest file describes how the parts of the course are organized, and lists the associated resources. 1. The file starts with a line that identifies it as an xml file. 2. The next line defines it as a manifest file (i.e., a file that lists contents). 3. 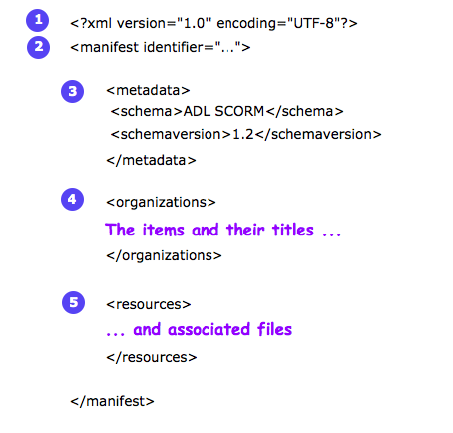 Next comes the metadata tag, describing the list as part of the SCORM standard, version 1.2. 4-5. What follows is the heart of the manifest, defining the learning module items and their titles, and the related resources (e.g., files). Thanks to the imsmanifest file and rest of the information defined in SCORM’s XML files and APIs, any LMS that supports the SCORM standard can successfully store, display, and track any Web-based online learning content written to the same standard. The metadata in the XML files discloses the meaning and context of the information in the elearning modules, and the LMS processes it as appropriate. In our next post, we’ll look at one more example of how XML is used to create the metadata that describes the meaning and context of information, this time in an ebook. XML is the workhorse of metadata and the semantic Web, the means by which we describe the meaning and context of information on the Web. XML stands for eXtensible Markup Language. It pops up all over the place, specifying contents and navigation in elearning, in ebooks, and on the Web. XML is a markup language much like HTML (HyperText Markup Language), the language we use to display the words, pictures, sounds, and video that make up the Web. What is a markup language? It is a system of rules and hidden tags (i.e., labels) that let us define how data can be stored, displayed, or processed. It is quite powerful but quite simple in structure. It’s based on plain text and designed to be readable by both humans and machines. Here’s a simple example of HTML markup. As you can see, this is not rocket science! The <H1> tag indicates where the heading should start, and the </H1> indicates where the heading should end. Likewise, the <p> and </p> tags indicate where the paragraphs should start and end. Of course there are lots of tags, and lots of complexity in how those tags can be used and nested, but the underlying scheme is straightforward. HTML and XML are similar in nature, both being markup languages, but they have a couple of key differences. the browser wouldn’t know what you were talking about, and would not display your heading correctly. HTML is an open standard. And while it is constantly evolving, it is well known to both Web developers and browser developers, so generally what we code is rendered properly. XML, on the other hand, is not designed to display data, it’s designed to provide meaning and context for data, so the markup is used to do that. XML provides meaning and context for data, and provides it using plain text, so it can be easily written and read by any application (as well as by people). Also, XML tags are not predefined; you or an outside organization can define the meaning of the tag and link to its definition. The meaning and context of the data is conveyed both by the tag itself and by the linked definition of the tag, called an XML Name Space (xmlns). Of course the point is not to learn how to code XML, but to understand its power, and how it is used under the hood in Web sites, in e-learning delivery (e.g., SCORM), and in ebooks, all of which are key to the future of learning. In the next two posts, we’ll look at a couple of examples of how XML is used, first in SCORM, and then in an ebook, to create the metadata that describe the meaning and context of that information. Metadata is information about information. Metadata typically describes an information resource (e.g., a Web page, an image, a document, an e-learning module, an ebook) by specifying its creation, purpose, author, location, and any other data helpful in utilizing it. 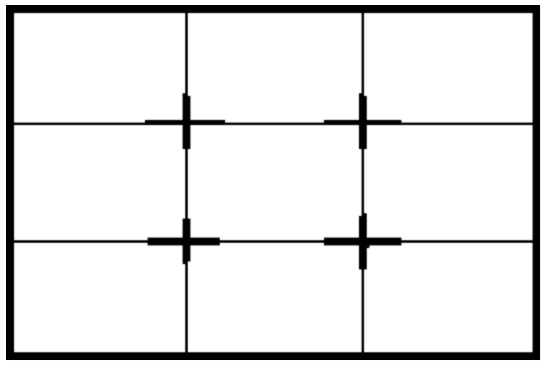 For example, an image may contain information about its size and resolution, and a document may contain information about its length. Both the SCORM and Tin Can specifications are at heart metadata, since they define how to specify information (e.g., module structure, navigation) about a resource (e.g., the e-learning course) in an organized fashion. Metadata is not a new concept; librarians have been using it for years in card catalogs to manage their book collections. Almost every book on the market in the United States today has metadata associated with it in the form of Library of Congress Cataloging-in-Publication information, including author, title, ISBN, subject category and subcategories, number of pages, length of the physical book, Library of Congress Control Number, and cataloging numbers. 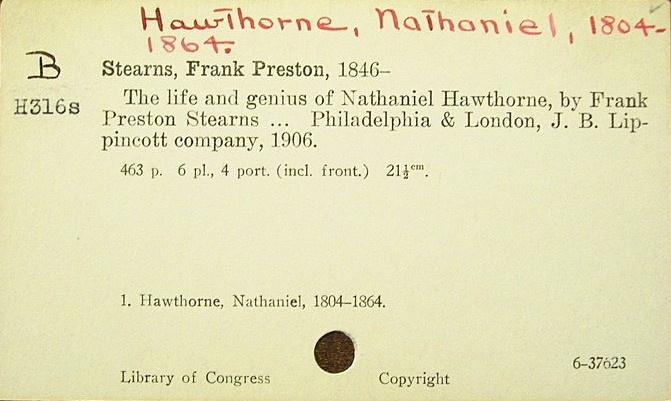 Unlike the card above, of course, today this information lives in servers and is easily searchable, not only because it’s computerized, but because the Library of Congress previously defined the types of information it thought necessary to collect about each book, allowing searches within a specific category. For example, if you wanted to find a book by an author named Joe Homer, you could search on “author,” and skip all the other books about the Greek poet Homer, the books about Homer Simpson, and books about famous home runs in baseball history. Just specifying that the word Homer is a part of the author’s name, and not a part of a title or a subject, makes your search that much more effective. Thus, a key component of any type of metadata is a specification of the individual types of information to be collected, and a definition of each. Wouldn’t it be nice if the Web itself had a real digital card catalog and not just a brute force text search, which often returns completely irrelevant (and occasionally quite entertaining) results? There actually are some starting to appear. A number of groups have developed and continue to evolve standards for the incorporation of metadata into Web sites. One of the first is called the Dublin Core Metadata Initiative; two other current standards of interest are Microformats and RDFa. Metadata standards such as the Dublin Core not only specify searchable types of information about a resource, they contain a clear definition of that information. A Dublin Core date, for example, is defined as YYYY-MM-DD, so 2014-03-09 means March 9th, not September 3rd. While this may appear trivial, the automated search of metadata by computers requires that the exact meaning of each data element be agreed upon, documented, stored on the Web, and linked to, so it is obvious what metadata definitions are being utilized. What’s the purpose of all of this metadata? One purpose is to help computers better understand the meaning behind a Web resource, so that they can do a better job helping you find what you want. Let’s say you do a search for the term “Chicago Fire.” Are you looking for the TV show, the conflagration that burned down the city in 1871, or the Chicago Fire soccer club? If a Web page contained information that better specified its meaning by noting that the Web page was about an event that occurred at a specific time (i.e., 1871), and the search engine was able to take advantage of it, then your search would return a much more meaningful set of results. Another purpose of metadata is to enable computers to better communicate with one another as they do our bidding. Let’s say you are looking for the location of a monument in a park. If a Web site that contained that monument’s information also contained its precise latitude and longitude (e.g., 41.882406, -87.62382), that would be great, but your app would not necessarily know that those two numbers meant latitude and longitude. With the proper metadata—often just simple text tags in the Web site code—your app could then recognize and utilize that information, and present you with a map that showed the monument’s location as well as your own. The simple addition of metadata describing the meaning and context of the information on a Web site can make a huge difference in its usefulness. When Tim Berners-Lee, the inventor of the Web, speaks of the Semantic Web, this is what he means: people and computers working more closely together to improve the meaning and the context of the information on the Web. He envisions people creating metadata to disclose meaning and context, and computers cranking through that metadata, processing it as appropriate. In our next post, we’ll look at how such meaning and context can be added via XML. The World Wide Web: Happy 25th Anniversary! Twenty-five years ago, on March 12, 1989, Tim Berners-Lee filed the proposal for what was to become the World Wide Web. Check out this message from Tim Berners-Lee, on the Web’s 25th Anniversary. For more information, see www.webat25.org, including a copy of the proposal itself. Psychologist Shawn Achor argues that happiness inspires productivity and success. As a culture, we keep pushing happiness over the cognitive horizon by assuming success will make us happy, yet it’s actually the other way around. The Tin Can application programming interface, or API, (also known as The Experience API or xAPI) is the next generation of SCORM. Why is it worthwhile to evolve a new standard for learning content? We’ve seen how the SCORM standard can enable Web-based online learning content and a learning management system (LMS) to communicate, and it does a fine job of it. But here’s what it doesn’t do. SCORM is not useful outside the context of an LMS. Tin Can is more versatile because it can manage information about learning that happens both inside and outside of an LMS. SCORM can’t manage any learning that takes place outside of a Web browser. Tin Can is more useful because it can manage information about learning that happens both inside and outside of a Web browser. What kind of learning happens outside of an LMS and outside of a Web browser? Learning based on mobile apps, for one. And learning that starts on a mobile app or in a classroom and ends up in a Web browser. Or learning that is hosted on a server that is separate from an LMS. Or learning that is based on games or simulations. Or learning that is informal, like learning that occurs via YouTube, a book, a TED talk, a conference program, a Wikipedia article, or a mentoring session. Tin Can can also track information that is interactive, or team-based, or long-term, or based on real-world performance. Because Tin Can handles a much wider set of learning situations, it can provide a much more accurate picture of learners and learning. It also does the usual things you’d expect, such as tracking completion, tracking time, tracking pass/fail, and reporting scores. Tin Can can report more fully on learning because of its wider scope and because more information is collected, which can be broken out or consolidated in many different ways. Many authoring tools (e.g., Articulate Storyline, Lectora) generate output for SCORM, as well as for Tin Can. And even though Tin Can expands the range of learning that can be tracked and decouples the hosting of learning content from its tracking, existing SCORM-based content is usable in a Tin Can environment with an appropriate software interface. So what does Tin Can look like? Learners can use Tin Can–enabled Web browser plug-ins and mobile apps to capture and send such learning events to a Learning Record Store, or LRS. The Tin Can API defines how software applications build and report on the learning experiences described by the learning record statements in the LRS, and all the related information necessary to support it. Because Tin Can is an open standard, the learning records in an LRS can be scrutinized in many ways, and information in multiple LRSs can be shared, consolidated, and analyzed as necessary. A learner can also post learning records to multiple LRSs. 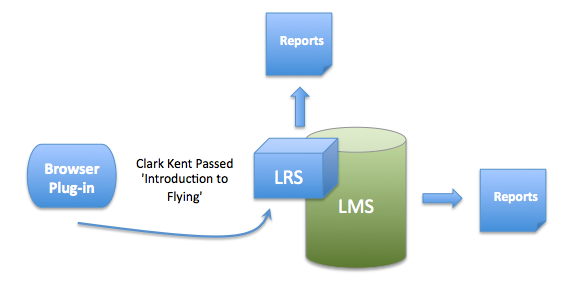 The learning records in an LRS can also be accessed and reported on by an LMS with the proper software interface, as constrained by the LMS’s reporting capabilities. Tin Can is still a work in progress, but it provides the flexibility and openness to capture formal, as well as informal and social learning and performance as it actually happens. Like SCORM, Tin Can is overseen by Advanced Distributed Learning, a research group sponsored by the United States Department of Defense. Both SCORM and Tin Can are examples of metadata, or information about information, which is the topic of our next post. SCORM stands for “Sharable Content Object Reference Model.” It is a set of technical standards that define how Web-based online learning content and LMSs communicate with each other. SCORM is managed by Advanced Distributed Learning (http://www.adlnet.gov/), a research group sponsored by the United States Department of Defense. 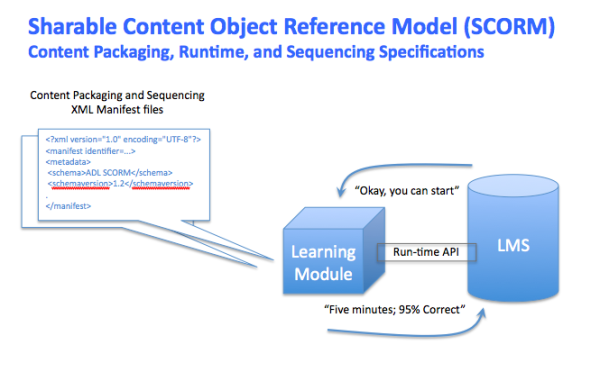 SCORM is composed of three sub-specifications: the content packaging section, the run-time section, and the sequencing section. The sequencing section specifies how the learner can navigate between the parts of the course. Like the content packaging section, it is defined by a set of rules and attributes in an XML manifest file. For example, the sequencing section defines which navigation controls the learner will see, determines whether there will be a navigable table of contents, defines any prerequisites within the content, controls which questions display, and determines whether the learner will be taken back to any sections not mastered. The SCORM specification has evolved over the years. Two versions have gained widespread acceptance: SCORM 1.2 and SCORM 2004. SCORM continues to evolve. The next generation of SCORM is called the Tin Can API, which we’ll talk about in the next post. This is the first of a related series of posts on Fun Tech Stuff going under the hood with XML and its uses in learning technologies: Learning Management Systems, SCORM, Tin Can, Metadata, and XML, as well as examples of XML in SCORM and XML in eBooks. When you take an online class, you typically go to a Web site, sign in with a login and password, and see a class or a list of classes you are scheduled to take. After going through the material, you and your organization usually receive some sort of notification of completion, and depending on the curriculum, you may be queued up to take the next class. Along with the course material, your learning experience was brought to you by an LMS. Colleges and universities use LMSs like Blackboard and Moodle to deliver online courses, and corporate training departments use a wide variety of LMSs to deliver online learning, finding them very handy for tracking such things as compliance training and continuing professional education. 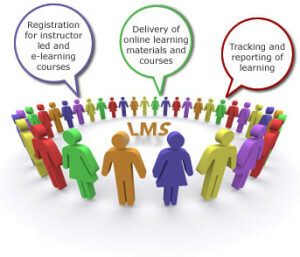 Since the LMS provides a framework for course material, it has to be able to handle courses developed by a wide range of authoring systems. How can this happen? Through the magic of standards. If an LMS supports the relevant standard, in this case a standard called SCORM, and the authoring tool supports it, then the content produced by the authoring tool will play well with the LMS. Most LMSs on the market today are SCORM-compliant. SCORM stands for “Sharable Content Object Reference Model,” and is the de facto industry standard for e-learning interoperability. In the next post we’ll take a closer look at SCORM. In the not so distant past, utilizing video for training was not a simple undertaking. No quick and easy way existed to share and watch videos globally with your employees unless you created and burned multiple DVDs. These DVDs would then have to be shipped to the recipients. In an office setting, viewing was usually done in a group, involved reserving a conference room, and often involved the challenge of working around participants’ schedules. As technology has made so much easily accessible online, it has also made video training that much easier. Now, all you need to do is to provide a link to a training video, and your employees can watch it anywhere, from their phones, tablets, laptops, or desktops. This is one reason why video training is one of the best approaches that a company can utilize to bring ideas and new information to their employees. Not only can you reach millions of people with one link, but you can save valuable resources by giving your employees the freedom to train at their own pace. We have all been in meetings or training sessions where something has gotten past us, or we didn’t quite catch what the person was saying. With online training videos, employees are able to stop, rewind, and review without having to feel like they are holding up others. It gives them freedom to really focus on the message and learn the task at hand. And training videos are more engaging to the viewer. Yes, it would be great if you could give hands on training to all of your employees, but that is often not possible. 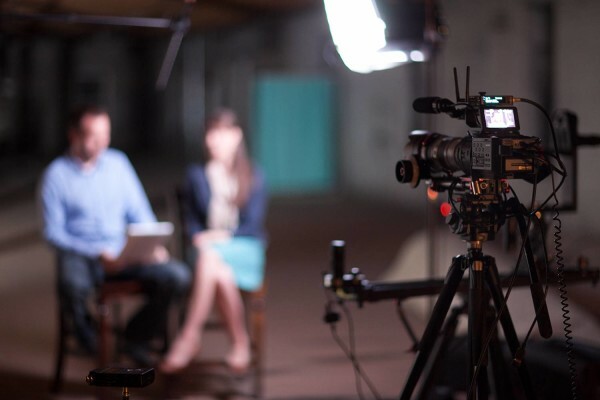 Training videos can more easily capture the attention of your employees with animations, music, creative b-roll footage and compelling interviews. They make it a more personal experience for everyone involved. At Envision Group Consulting, our team of trained video production specialists can take your ideas and bring them to life, helping you create engaging video at a surprisingly reasonable cost. Please take a moment to view a sample of our video production work, think about how we might help you leverage the power of video in your learning strategy, and give us a call! What I personally love about the film is that it gives viewers the opportunity to make up their own narrative on the subjects they see, and lets viewers interpret what’s on the screen in their own individual ways. It makes viewers not only think about the subject matter, but it also allows them the opportunity to participate in the storytelling. I think it’s safe to say that when most people go see a great film, eat out at a great restaurant, or use a great product, they’ll want to talk about it. They like to share their experiences with their friends and family. Facebook status updates, tweets on Twitter, and photos on Instagram are all ways in which people do this. One thing that Samsara does well is make you think about what you just saw, make you want to discuss it with other people, and hear other viewpoints. I think businesses could benefit from a similar approach in training. What if you have a specific message that you are trying to convey, but there are numerous ways that it can appeal to people? What if people came together to discuss what they learned in a training series, and in doing so, saw other interpretations that they might not have originally understood? There are films and TV shows and business presentations that feel like they come off an assembly line. They are stale, regurgitated, and uninteresting. Why not have your company stand out from the rest? Exploring visual storytelling, narrative participation, and discussion are all ways to make your training and your company different and original. A healthy discussion is, well… healthy. Watch the trailer (in HD preferably) below. One of my favorite tools these days is an online tool (also usable offline) called Prezi. It provides an easy way to collaborate, create, and share great-looking presentations with other people anywhere. Imagine being able to take the animation capabilities of a tool like After Effects, and the presentation possibilities of PowerPoint, and merge them into one easy-to-use program! The first thing that stood out about Prezi is how interactive it is and how it allows me to work in a non-linear fashion with my presentation. Sometimes I get ideas when I’m working on a project, but if certain aspects of the project are not yet complete, it can be hard to move forward with that new idea. With Prezi, if an idea pops into my head, I can easily move to that part of the presentation, or at least start to create my idea right there and save it for later. With so many different templates to choose from and the capabilities to upload your own designs, Prezi allows you to easily make your presentation stand out from the usual one-dimensional slide show. The learning curve is simple as well. 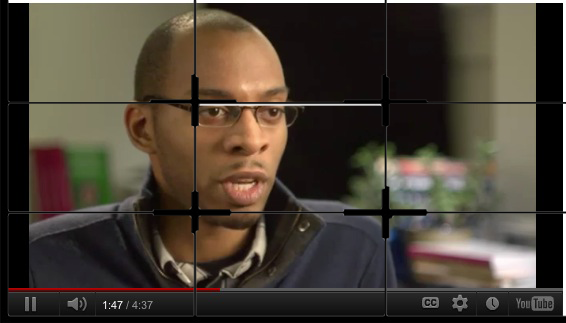 You simply click where you want to make your edits and move your images where you would like them to appear. You can easily manipulate your Prezi to add images, videos, music, and more. I never thought I would say this, but it is actually kind of fun making presentations now that I use Prezi. Here are a couple very short videos on Prezi, and a link to the Web site. Check it out! A great TED talk by Simon Sinek: How great leaders inspire action. Fascinated by the leaders and companies that make the greatest impact in the world, those with the capacity to inspire, he has discovered some remarkable patterns of how they think, act and communicate. In this 18 minute TED talk, he shares his insights. Creating a custom training solution involves consciously making a large number of tradeoffs between the nature and scope of the training and its costs, in order to achieve the objectives of the training. As each of these tradeoffs is being made, we like to put our clients in the driver’s seat. To that end, let’s take a look at some of the key drivers that affect the nature and scope of training solutions and their costs. (LOW): The training will be less than one day long. (MEDIUM): The training will be several days or up to a week long. (HIGH): The training is comprised of multiple courses or an entire curriculum. (LOW): The subject matter is straightforward and easy to learn. (MEDIUM): The subject matter is complex and requires ramp-up time to thoroughly understand and apply. (HIGH): The subject matter is very sophisticated and requires considerable ramp-up time or prior knowledge base to thoroughly understand and apply. (LOW): There is one or a small number of SMEs and stakeholders that are easily accessible. Decision making and approvals will be fairly straightforward. (MEDIUM): There are a fairly large number of SMEs and stakeholders. Decision making and approvals will be more difficult. (HIGH): There are a large number of SMEs and stakeholders that may be geographically dispersed. Decision making and approvals will be difficult. (LOW): The training involves an update of existing training materials and may require a change in delivery method. The content exists either electronically or on paper and is fairly up-to-date. (MEDIUM): The training involves development of a new training course. The content is more difficult to obtain and may require working closely with SMEs. (HIGH): The training involves a new training course or curriculum or extensive changes to existing training. The content is more difficult to obtain and may require working closely with SMEs and stakeholders and/or conducting outside research.